Mike Fiechtner Photography || Seattle Wedding, Family and Senior Photographer — Always remember why you started! Always remember why you started! When you start something new it's very easy to look at the best and get jealous of what they can do. It's easy to expect instant success and want all of the accolades. But there is so much to learn and baby steps one must take to get good at something. This is the case in all things. 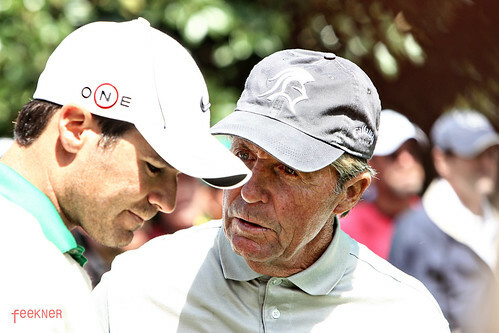 The photo I included below is of Trevor Immelman and Gary Player at the Masters golf tournament this year. Both are South Africans and both have won the Masters. Do you think Trevor Immelman watched Gary Player when he started learning to golf and got jealous or discouraged? I can't say for certain but I'm guessing he probably did. I can also guess that he learned quite a bit from Gary Player which helped him to become the golfer he is today and ultimately win the Masters in 2008. When I got started with photography I began looking around on the internet at other photographers work and it was easy to get discouraged. I would think that there is no way to create some of the images that they take or get to the same point in the photography world. But one thing I've already learned is that is just takes practice and patience and you'll slowly start to learn the tricks of the trade. Although I do think that some people have a general knack for photography while others will always be a casual shooter. Just like I'm a casual golfer and Trevor Immelman is a Masters champion. Will I ever be like a Chase Jarvis or Joey Lawrence? Maybe I will and maybe I won't, but I can't let their success get me down because I'm guessing they both started at the same place I did. There is definitely a lot too that can be learned from "Masters" as well as through the hard way, making mistakes. One could argue that this is one of the added benefits of digital photography....the ability to look at a photo on your LCD screen, adjust and re-take if something isn't right. You could also look at this from the flip side that it's a downfall of the digital world. People don't always learn how to truly use their camera and understand what the best settings might be for ISO, aperture or shutter speed. If they screw up....they can just take another photo. Ultimately it's all about your enjoyment, whether with photography or other hobbies, and what YOU get out of them. I'm learning that some people could care less about my obsession with photography and might not even like my photos. At first this was something that bothered me but I'm trying to remember why I started this.....to have fun and produce unique photos. If in the end people like my photos or want to pay me for my services and someday I become the Trevor Immelman or Gary Player of the photography world then that is just an added bonus. But I'm not going to let that ruin the true joy I have for this. So ask yourself why you do something you enjoy, whether it be a musical instrument, photography, or sports? Is it to be the best and get all of the accolades or is it for your own enjoyment? No matter where this photography business takes me I will always try to remember why I got in this.....to have fun.